WASHINGTON -- Diagnosing if a tick bite caused Lyme or another disease can be difficult but scientists are developing a new way to do it early — using a "signature" of molecules in patients' blood. It's still highly experimental, but initial studies suggest the novel tool just might uncover early-stage Lyme disease more accurately than today's standard test, researchers reported Wednesday. And it could tell the difference between two tick-borne diseases with nearly identical early symptoms. "Think about it as looking at a fingerprint," said microbiology professor John Belisle of Colorado State University, who helped lead the research. Lyme disease is estimated to infect 300,000 people in the U.S. every year. 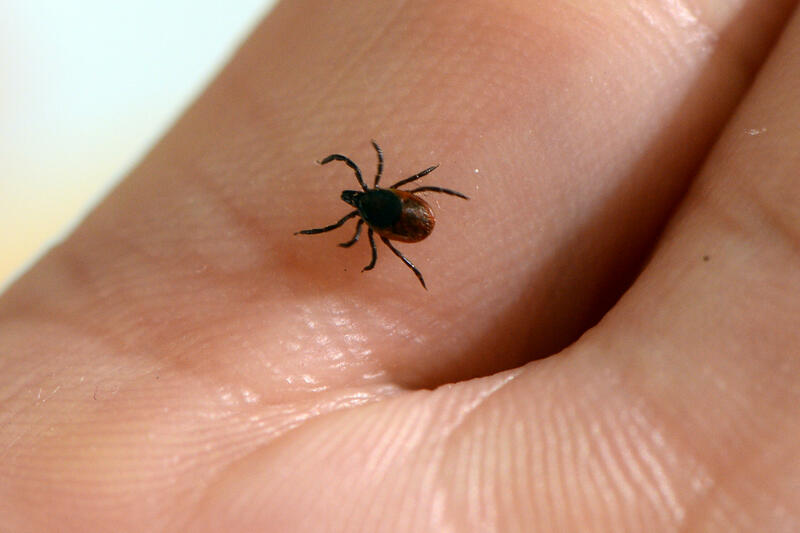 Lyme-causing bacteria are spread by blacklegged ticks —also called deer ticks — primarily in the Northeast and Midwest, although their range is spreading. Lyme typically starts as a fever, fatigue and flu-like symptoms — often but not always with a hallmark bulls-eye rash — and people usually recover quickly with prompt antibiotics. But untreated, Lyme causes more serious complications, including swollen joints and arthritis, memory and concentration problems, even irregular heartbeat. Yet today's best available test often misses early Lyme. It's considered no more than 40 percent accurate in the first few weeks of infection. It measures infection-fighting antibodies the immune system produces. Those take a while to form, making the test more useful a month or more after infection sets in than when people first start feeling ill.
"We are trying our best to come up with something to help the diagnosis in the very early stages of this infection," said microbiologist Claudia Molins of the Centers for Disease Control and Prevention, who teamed with Belisle to develop a new test. "Our goal really is to try to fill that gap." The new approach essentially looks for a biochemical fingerprint that shows the body is beginning to respond to an infection, long before antibodies mobilize. It's based on cellular metabolism, subtle changes in the kind and amount of small molecules that cells produce, such as sugars and amino acids and fats. First, Belisle and Molins found a signature — specific changes in those metabolites — that enabled them to distinguish between blood from Lyme patients and from healthy people. The tougher hurdle: Could the tool also tell the difference between Lyme and a disease with very similar symptoms? To tell, they compared a mysterious Lyme look-alike called Southern Tick-Associated Rash Illness, or STARI. STARI is spread by a different tick, the Lone Star tick that is found widely throughout the East and Southeast, areas that overlap with the Lyme-carrying blacklegged ticks. STARI involves a round rash and other symptoms similar to early Lyme, and is treated with the same antibiotic — but it's not caused by the same bacteria. In fact, scientists don't yet know the cause of STARI, and there's no test for it. The only way to identify STARI is to definitively rule out other ailments. Using carefully stored blood samples from people determined to have either Lyme or STARI, Belisle and Molins found biomarkers that could tell the two disease apart. Using those markers to study additional blood samples, they concluded their tool was 82 percent accurate in determining early Lyme — far better than today's standard, Molins said. "It is a very novel way of looking at diagnosis," said Dr. John Aucott, who directs Johns Hopkins University's Lyme Disease Clinical Research Center. He was not involved in the new study, and notes that other test approaches are being explored, too. Creating a test will take several more years of research, cautioned Molins. First, the team is turning its sophisticated metabolic-measuring techniques into a test that standard laboratories could use. Then, with next spring's tick season, researchers will start a new round of testing. Hopkins' Aucott cautions that other infections unrelated to ticks can be confused with Lyme, too, so any new test also would have to rule out those possibilities. But better early diagnosis isn't the only need, he stressed. Today's Lyme test also can't prove if antibiotic treatment was successful, because it can detect antibodies even years after people recovered. He wonders if tracking cellular metabolism could solve that problem. "If you can show the host metabolic signature goes back to normal, that could be a great test of cure," he said.